No Frigate Like a Book: An Unplanned Way-Station and Review of the "Race to the Pole"
An Unplanned Way-Station and Review of the "Race to the Pole"
How important is an author's personal experience with a topic? Is it better when an author openly declares his biases so that the reader may judge his work accordingly, or it it better if the writer attempts to disguise, however half-heartedly, his own point of view? Can one attempt to "set the record straight" without inevitably falling into new errors of over-correction and prejudice? Should a reader even attempt a book when he or she has all ready formed an opinion of the author? I grappled with these questions as much as any opinions I had of Robert Falcon Scott's competence--or lack thereof--while reading the "Race to the Pole". It wasn't my intention to wander into the bramble-patch (or rather, in recognition of the climate, the shifting ice-floe pack) of the Scott/Amundsen controversy. Unfortunately, my audio version of "The Worst Journey in the World" dispensed with both Cherry-Garrard's own introduction and lacked either George Seaver or Caroline Alexander's foreword, but plunged directly into the narration. I grew more confused as the story went on, and I was completely befuddled when the Terra Nova finally reached the Antarctic. Where was Ross Island? What was this King Edward VII peninsula? What did Cherry mean by Shackleton's old encampment? I badly needed some good maps and a printed copy of the book, so I dashed off to the library. I could see with a quick fan of the Carroll-Graf edition of "The Worst Journey of the World" that the book seemed to be lacking in maps and definitely didn't have any photographs--inexcusable for an expedition that had two official photographers on board--so I picked up the only other book on the shelf that dealt with the Scott expedition: Sir Ranulph Fiennes 's "Race to the Pole." I hoped that I wouldn't have to read it, but unfortunately, Seaver's foreword was quite turgid and seemed to be more interested in exploring the origins of Cherry-Garrard's name (French, by the way) than concerning itself with such mundane matters as to how and why the expedition was funded; indeed, most of it was merely a dry recounting of the book itself. There was exactly one map, in the index, alongside a listless one page glossary defining such words as "blizzard" and "ice fog." So Sir Ranulph Fiennes it would have to be. 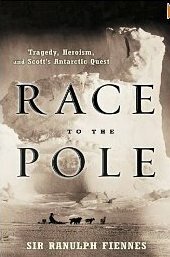 I tried skipping to the last section of the book, but there seemed to be a great deal of ranting about Roland Huntford, the author of "The Last Place on Earth"--a book that is quite critical of Scott and his handling of his two trips to the South Pole--instead of a dispassionate account of the expedition itself. I looked at the dedication: "To the Families of the Defamed Dead". Uh-oh. Clearly, here was an Author With An Agenda. A quick Internet search revealed an author with a Byronic self-regard (with an autobiography entitled 'Mad, Bad, and Dangerous to Know" how could one think otherwise?) and a penchant for a bit of impromptu DIY surgery in the garden shed when a clutch of frost-bitten fingers proved troublesome. I had had enough of these guys when my husband was in an F-14 squadron. Should I look for another book? Or would they all be equally one-sided? I decided to give his sir-ship another chance and started his book, properly this time, from the beginning. Ranulph Fiennes believes the general British self-loathing, as he sees it, due to loss of empire and dwindling importance on the international stage, has made society eager to tear down symbols of a more heroic age, and Robert Falcon Scott is a primary target of this disgruntled generation. He also believes all of the great explorers made mistakes, and Scott's death, and those of his men, was more through bad luck than anything else. These are reasonable assertions; I happen to agree with them. Unfortunately, in his eagerness to debunk the debunkers, Fiennes has no compunction about twisting the facts, cherry-picking through the expeditionary diaries, and contradicting himself at every turn, as long as it is a point he is intent on making at that moment. No one else can dare make a evaluation on these matters--not just on technical concerns, but on Scott's organization abilities and judgment. Only he, the great man-hauling adventurer, knows the truth. The overall feeling is like having a very large man looming over you and poking you in the chest if you dare voice an objection. Scott and Shackleton rivals? No, and he can sift through the diaries and prove it. Scott disorganized? Impulsive? Class-conscious? No, no, no, and he can find just the passage to make his point. First Cherry-Garrard is "unhinged" when he says something uncomplimentary about Scott; at other times Cherry's mind "was clear as a bell until the end." The thirty five pounds of scientific specimens that Scott hauled until the end? A negligible weight--though the author brags about dispensing with his own toothbrush (and why is it always the toothbrush that becomes the fetish object with these travel-lightly trekkers?) on his own man-hauling across the Antarctic. He airily dismisses one of the main complaints about Scott--that without previous planning, he decided to bring along an extra man in the final push to the Pole. Five men can easily fit into a tent made for four! He doesn't even address one of the most damning results of Scott's decision: three men went back, instead of four, from the final supply party--something you are never supposed to do, as a minimum of four people-- "two to go and two to stay"--is a fundamental rule of wilderness exploration. One of the men fell desperately ill of scurvy on the way back, and the strongest member of the party made a two day march alone, when he could have easily fallen into a crevass and died. As it was, he made it back to the main camp a mere half hour before a blizzard hit, and it was lucky they saved the other two men. Fiennes doesn't even bother mentioning the homeward journey of the three dismissed men; it would have interfered with his theory of Robert Scott as a man of infallible good judgment. In the end, Fiennes makes the quite astonishing statement that Scott's achievement was greater than that of Amundsen's. Why? Because he did it the harder way? Because all the men of the final party died, thereby creating a legend? Cherry-Garrard himself said that there was no particular value in suffering for suffering's sake; so did Shackleton. Even the author remarks that any fool can be uncomfortable. Fiennes quotes the one member of Amundsen's team who praised Scott, conveniently forgetting that it is much like the remark of the Iron Man winner who states that the competitor who needs a day to finish the race is somehow more admirable than the victor since the trailing loser expended more energy--a comment that is more made out of pity than anything else, and is not an assessment to be taken seriously. Amundsen's accomplishments--using dogs to spare his men, reaching the South Pole first, and bringing all of his men home safely--are merely bothersome details about a man who could only win out of "deception." There is no doubt that Sir Ranulph Fiennes believes himself to be a throw-back to a more glorious age, or failing that, at least the lantern-bearer for a less enlightened era. If that's the case, he represents the worst clichés of that long-ago time. Condescending. Blustering. Snobbish. Dismissive of other ideas. Whereas Cherry-Garrard represents the best aspects of his epoch: Sensitive. Classically educated. Gallant in the face of adversity. I would like to read Sara Wheeler's biography of Cherry-Garrard; and Huntford's book as well. I would like to get at the truth, but even Fiennes admits that there is no final truth, or if indeed there is one, it lies in the grave along with Scott, Wilson and Bowers. But I can't wander around the Antarctic for the entire year, so I must go where Cherry-Garrard's memoir ends: New Zealand. I hate it when author's attack others. I'll take your advice and read Cherry's instead. It is a great book, and good-hearted too, without being saccharine. I loved it.